We cannot fully understand DNA, its properties, functions and threats without a bioinformatics approach to study it. Researchers at the School of Biological Sciences of Georgia Tech with PhD student Alli Gombolay, Dr. Fredrik Vannberg and Dr. Francesca Storici have developed a bioinformatics toolkit that precisely maps sites of ribonucleotides present in genomic DNA. DNA, the blue print of life, which we know to be made of deoxyribonucleotides, contains many scattered ribonucleotides (ribonucleoside monophosphates, or rNMPs) embedded in its sequence. rNMPs in DNA alter DNA structure and properties, and often are sites of mutation and strand breakage. Specific high-throughput sequencing techniques have been recently developed to mark the presence of the rNMPs in genomic DNA. The discovery of hotspot sites and particular patterns of rNMP presence in genomic DNA requires the analysis of large sets of sequencing data. Currently, computational methods to study rNMPs embedded in DNA are highly customized and are not designed as platform-independent, automated pipelines that allow for fast, scalable analyses. Alli Gombolay, a PhD student in the bioinformatics program in the group of Dr. Francesca Storici, in collaboration with Dr. Fredrik Vannberg, designed and tested the scripts of the Ribose-Map software. By accommodating data from each technique available for rNMP mapping, Ribose-Map is a unique pipeline to standardize the analysis of rNMPs embedded in DNA, increasing the reproducibility of rNMP-capture experiments and enabling a head-to-head comparison of these techniques. Ribose-Map transforms raw sequencing data into summary datasets and publication-ready visualizations of results. The Storici’s lab recently set up a molecular biology technique, ribose-seq, to build genomic libraries of rNMP sites by directly capturing DNA sequences containing an rNMP. “We can build ribose-seq libraries form any DNA of interest, and now, with Ribose-Map, we can also analyze the sequencing data from ribose-seq or other techniques in a straightforward and efficient manner” says Storici. The Ribose-Map pipeline standardizes and speeds up the analyses of sequencing data obtained from libraries of rNMP sites. It will help the scientific community in the efforts to uncover rNMP spectra, biomarkers and sites of potential distortion or fragility in any type of DNA source, bacterial, fungus, plant or animal cells, from healthy or diseased cells. This project was supported by the National Institute of Health grants (R01ES026243-01 to F.S. and R01EB025022-01 to F.O.V. ), the Parker H. Petit Institute for Bioengineering and Bioscience at the Georgia Institute of Technology grant (12456H2 to F.S. ), the Howard Hughes Medical Institute Faculty Scholar grant (55108574 to F.S.). 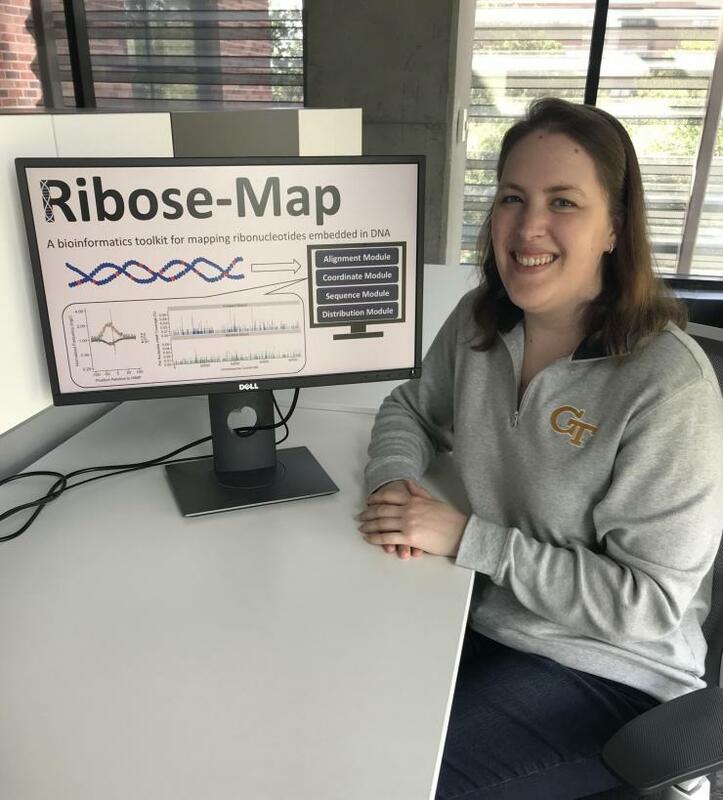 Georgia Tech Bioinformatics PhD student, Alli Gombolay, with a graphical representation of the input/output of the Ribose-Map toolkit.